Why Use A Choke Free Dog Harnesses? Our nylon dog harness is good for dogs that have neck problems and can't wear a collar or harness that buckles around the neck. 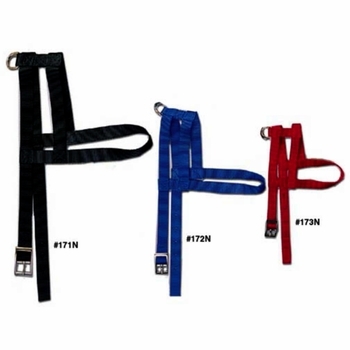 This harness is 5/8 inch wide 1-ply nylon with a metal buckle in sizes 14, 16 18 and 20. Chest Strap sizes are to center hole. 2 inches take-up and let out. Measure you dog around his chest. Order the size closest to his chest size. For example a size 14 harness will adjust from 12 inches to 16 inches. Copyright 1999 to 2019, Morrco All rights reserved.